SBI Clerks Mains Exam Results (Junior Associates) 2019 : SBI Clerk Mains Exam Results 2018 to be declared on sbi.co.in/careers: State Bank of India, SBI is expected to release the SBI Clerk Mains Exam 2018 results on September 6, 2018 on the official website sbi.co.in/careers. The bank is expected to release the results of the SBI Clerk 2018 main examination conducted on August 5, 2018. The State Bank of India will declare the result of SBI clerk main examination 2018 on Saturday, September 22. The state-run bank has issued a notification saying that the SBI Clerk main examination result is expected to be declared on September 22 and the joining date for the provisionally selected candidate is expected to be first week of December. 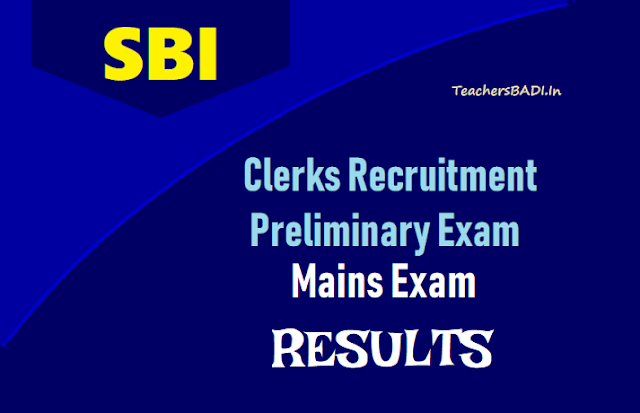 How to check SBI Clerk (Junior Associates) Main Result 2018? The SBI clerk main exam was held on August 5. The two-hour forty minute SBI clerk main exam was for 200 marks and divided into four sections: General and financial awareness (50 marks), General English (40 marks), quantitative aptitude (50 marks) and reasoning ability and computer aptitude (60 marks). Candidates were asked to answer 190 questions. Candidates were given 35 minutes each for general/financial awareness and general English and 45 minutes each for quantitative aptitude and reasoning ability section. The questions in objective tests, except for the test of general English, will be in both English and Hindi. The marks obtained in the prelims (Phase-I) will not be considered for the selection and only the aggregate marks obtained in the main exam (Phase-II) will hold in the final merit list. Provisional selection will be made on the basis of candidate’s performance in the main exam. A wait list of up to 50% of vacancies (state-category wise) will be maintained. Candidates will be released from this waitlist on a quarterly basis against non-joining and resignation out of the current batch, subject to the candidates securing minimum qualifying marks as may be stipulated by the bank for selection. This wait list will be valid for a period of one year from the date of declaration of final result. SBI Clerk Main result 2018 how to check: 1. Go to SBI’s official page, sbi.co.in, 2. Check the top right hand corner of the homepage and look for the career tab or click here., 3. On the right hand side of the page, look for ‘Latest announcements’ and click tenth dot which is for SBI Clerk recruitment., 4) Click on the link for SBI clerk main result, 5). A pdf page containing the roll numbers of qualified candidates will be displayed on the screen. State Bank of India, SBI is expected to release the SBI Clerk Mains Exam 2018 results on September 6, 2018 on the official website sbi.co.in/careers. The bank is expected to release the results of the SBI Clerk 2018 main examination conducted on August 5, 2018. The SBI Clerk Result 2018 would be released on the official website sbi.co.in/careers. Steps to check results and updates has been provided below. Candidates who have appeared for the examination are advised to note that the SBI Clerk Result 2018 date has not been released by the bank as yet Officially. It is expected, however, that the bank would be releasing the results soon and within the second week of September. Sources close to the bank had suggested that the SBI Clerk Mains Result 2018 would be released by the bank soon after the release of SBI PO Result 2018. The SBI PO Mains Result 2018 were declared last week. Step I: Go to the official website sbi.co.in/careers. Step II: Under the current recruitment section, scroll to the link for SBI Junior Associates Recruitment 2018. Step III: Once the results are announced, the link for Mains Result 2018 would be activated on the page. Step IV: Candidates can check their results by clicking on the activated link. Please note, the results have not been declared as yet and neither have the dates being confirmed. The information provided is based solely on the reports received. Confirmation of the declaration of the results would be shared, as and when received. Search for "Recruitment Of Junior Associates (Customer Support & Sales) In State Bank Of India - Advertisement No. CRPD/CR/2017-18/10"
SBI Clerk Prelims Result 2018 on sbi.co.in/careers: State Bank of India, SBI Clerk Result 2018 for the preliminary examination, conducted on June 23rd, 24th and 30th, is now available on the official SBI website, sbi.co.in/careers. Candidates can get access to the SBI Clerk Prelims 2018 Result via direct link below. Candidates should now be able to check their SBI Clerk Prelims Result 2018 as the website is now live back again. SBI Clerk Prelims Result 2018: State Bank of India, SBI has declared the SBI Clerk Prelims Result 2018. SBI Clerk Result 2018 for the preliminary examination conducted on June 23rd, 24th and 30th, has been released on the official website, sbi.co.in/careers. Candidates who had written the examination for recruitment at Junior Associate positions in Customer Support & Sales can now check the SBI Clerk Prelims 2018 result on the aforementioned website, following the steps and direct link given below.Candidates who have qualified the prelims examination would now be required to appear in the second round of SBI Clerk Recruitment 2018, i.e. the SBI Clerk Mains exam 2018 scheduled to be conducted on August 5, tentatively. Admit cards for the same may be released from July 23rd onwards, tentatively. In another news, SBI PO Prelims 2018 Result was released at night on July 16. Step 1: Go to sbi.co.in/careers. Step 2: From the ticker on the top, click on the scrolling link saying Recruitment Of Junior Associates (Customer Support & Sales) In State Bank Of India. Step 3: A new Ongoing Recruitment page would open. Step 4: Click on Preliminary Exam Results Announced. Step 5: A new PDF file would open or get downloaded. Step 6: Keep your admit card and roll number handy. Step 7: Press Ctrl+F keys simultaneously to find your roll number in the result sheet. Step 8: Enter roll number in the search box. Step 9: If your roll number is churned out that means you have been selected and are now eligible for Mains examination.